Stunning natural scenery, historic shipwrecks, hiking, biking, diving, and more—the list of attractions drawing visitors to the Bruce Peninsula in Ontario is impressive. It’s no wonder that Tobermory area accommodations are highly sought after, particularly during peak periods. Fortunately, there are a number of venues that accommodate campers. Below is a sampling of what a few of them have to offer. Drive-in campsites, back-country camping, or the relative luxury of overnighting in a yurt—Bruce Peninsula National Park, 15 kilometers from Tobermory, offers all of these options at or through the Cyprus Lake Campground on the shores of Cyprus Lake. The ten yurts book up quickly, particularly during peak season. These circular shelters are 20 feet in diameter, and come equipped with a wood stove, beds, and a table and chairs. 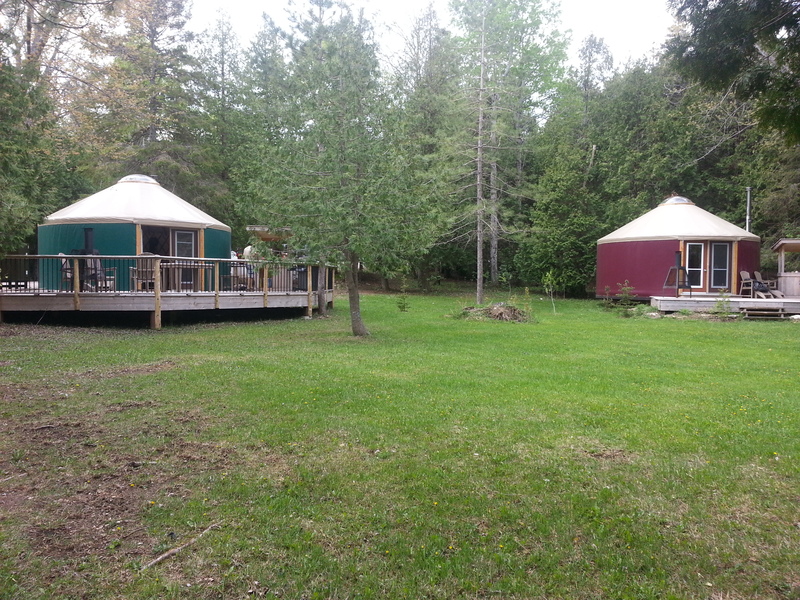 An attached large deck and a propane barbeque are part of the package with each yurt. Although the individual yurts are not equipped with washroom facilities, a nearby comfort station offers flush toilets and individual showers. No pets are allowed in the yurts or on the yurt sites. Cyprus Lake also offers 232 drive-in campsites on three campgrounds, Birches, Poplar and Tamarack. The down side: there are no serviced sites, and, unlike the relative luxury of the yurt campers, the tent and trailer sites do not offer shower facilities, although pay-for-use showers are offered by private businesses near the park. Those seeking a more rustic experience can check out back-country camping at the Stormhaven or High Dump sites. 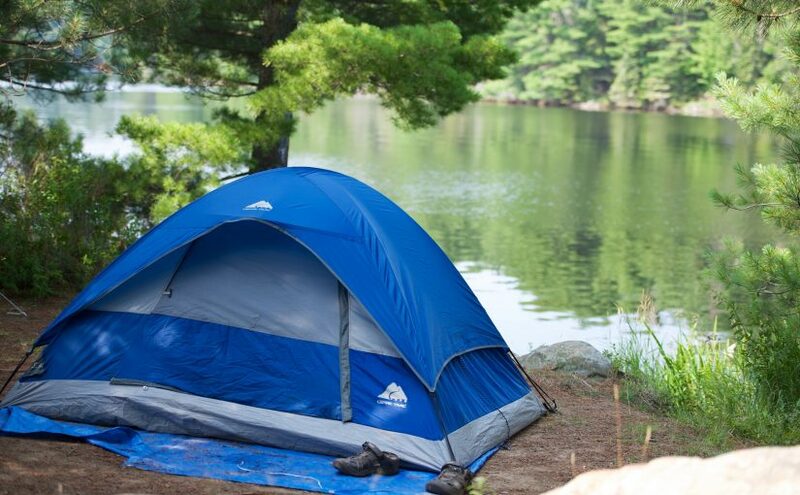 Back-country sites are booked through the Cyprus Lake Campground and are located along the Bruce Trail. Each of the back-country camping locations boasts nine sites with wooden tent platforms suitable for free-standing tents. No open fires or campfires are permitted at Stormhaven or High Dump, although campers may bring in their own cook stoves. As with many areas in the Bruce Peninsula, back-country campers are advised to follow bear-safe practices with food and scented items. Six tenting sites with wooden tent platforms offer a get-away-from-it-all camping experience on Flowerpot Island. Permits must be picked up from the Park Visitor Centre in Tobermory. While some campers travel to the island using their own boats, a private tour boat from Tobermory can also be taken to reach the campsites. Although leashed pets are allowed on the sites, campfires are banned. Campers should also bring extra supplies, as sometimes adverse weather necessitates a delay in departure timing from the island. But camping at this out-of-the-way spot may be worth it for the attractions: the chance to enjoy the scenery, visit a historic light station maintained by the Friends of the Bruce District Parks, and check out the hiking trails, which offer varying degrees of difficulty. For those who want to be handy to Tobermory, Lands End Park might fill the bill. Located 2.2 km from the town, the park is located on a 70 acre parcel, and offers accommodation for tents or recreational vehicles and trailers on its 121 sites. The park includes a self-guided hiking trail, a camp store, and various recreational sports amenities such as basketball, soccer, and volleyball. Canoe, kayak, boat, and bicycle rentals are available. A beach with a swimming area and a shallow wreck a mile away for divers to explore are additional attractions. Fishing and snorkeling are also popular activities. Located on Miller Lake, Summer House Park is just over 30 km from Tobermory. With 85 acres of hardwood forest, Summer House offers a small network of walking and biking trails, as well as a sandy beach on Miller Lake. In total, 235 sites are available, some with hydro, water and sewer hookups and others unserviced. Pull-through sites can accommodate larger RVs. Lakefront sites and wooded sites are also available. Summer House offers children’s programs from July 1 to Labour Day weekend. Adult activities are also available. Watercraft are available for rental, ranging from motor boats and sailboats to person-powered craft such as canoes, kayaks, rowboats, and paddleboats. Situated 6 km from downtown Tobermory, Harmony Acres is an option for those looking for a quiet stay surrounded by nature. A radio-free campground, Harmony Acres caters mostly to tent campers. A handful of electrical sites, and three larger sites with 30 amp electrical and water service are available for those with trailers or small RVs. In all, just under 50 campsites are available, including four venues suitable for group camping. Recreational opportunities include volleyball, frisbee, horse shoes and badminton, while a walking trail offers the opportunity for bird-watching, observing nature, and enjoying native wildflowers. Harmony Acres offers two star-gazing areas, and is a favored spot for night sky photography. The Tobermory area is in high demand during peak season, so reservations may be advisable particularly between July 1 and Labour Day weekend. Some venues require multi-day stays, especially around long weekends. If making reservations, check out each facility’s cancellation policies. Some demand an up-front deposit and will keep a sizeable chunk of it if you cancel. Wildlife viewing is one of the draws in the area, but that wildlife includes bears. Many of the venues advocate bear-safe practices, so it’s best to come prepared. The Massasauga Rattlesnake also calls the Bruce Peninsula home. Though these snakes are generally shy, hikers should be alert to the potential for their presence. Wearing long pants and sturdy shoes or hiking boots, and refraining from reaching into areas where you don’t have a good sight-line of what’s lurking are good precautions. Many of the parks enforce “quiet time” between 11 p.m. and 7 a.m., and some require campfires to be doused by midnight. It’s a good idea to check out each venue’s rules and regulations to ensure they fit with the kind of experience you’re looking for. Nice article on Tobermory. We have reservations to go to Lands End in July. Such a beautiful area. I have been very impressed with the Ontario Provencial Parks I have visited. Lake Superior, Algonquin, Awenda, Pinery and Killarney.